At Oak Floors Online, we appreciate that you can be overwhelmed with the wide selection of finishes available for your oak flooring and how important is it to select the right floor for your room and home. We have a wide range of finishes available for our oak flooring in both our engineered oak flooring and our solid oak flooring, so you are sure to find the right finish for you. If you are unsure of the difference between engineered oak flooring and solid oak flooring, we have a helpful guide to finishes available for you to understand which flooring will be best suited to your home and style of living. Our unfinished oak flooring range is available in both our solid oak flooring and engineered oak flooring with an especially wide choice available within our engineered oak flooring range. Unfinished oak flooring has the great benefit of allowing you the flexibility and luxury of choosing your own finish to your floor, allowing you to finish the floor in a way that suits your style and taste and that complements the décor in your home. If you make the choice of solid oak flooring for your home, you will benefit from beautiful oak floor boards that are machined from one piece of solid oak and that are ready to receive the finish of your selection on site in your home. Unfinished oak flooring such as our Unfinished Solid Oak allows you to create a bespoke look to your flooring and room with the highest quality flooring. Within our engineered oak flooring range, you have a choice of six different options of flooring that are unfinished, from the Unfinished Mixed Grade engineered oak flooring through to our unique Unfinished Extra Wide engineered oak flooring. Unfinished Mixed Grade engineered oak flooring is particularly popular in rooms with large staircases and other similar features as the option to finish the floor on site allows you to blend and match the floor perfectly with the existing surroundings. We are also finding that landlords are increasingly opting to have an unfinished oak flooring in their property and providing the tenant with the option of finishing it to their own taste. Unfinished AB Select Grade engineered oak flooring is our very own grade mix and does not include just grade A and B flooring. It is selected with an aim of reducing the amount of natural features that appear within the finished floor, but not to the extent of it looking like a laminate with none at all. This finish allows you the option of “self-grading” on site so that you can achieve exactly the look you want in your room. 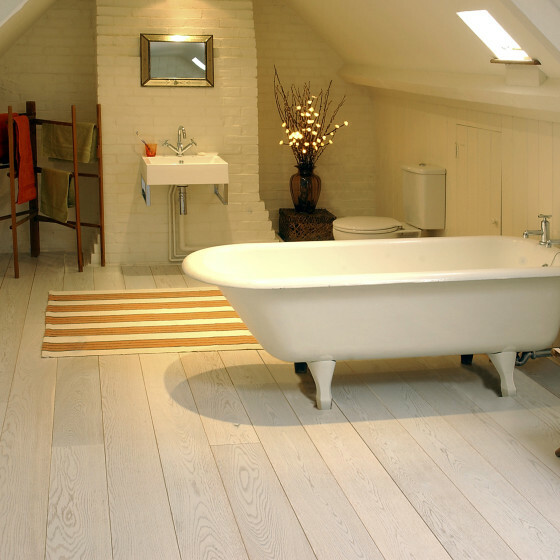 We supply a range of products that are suitable for installing over Under Floor Heating; any of our plywood backed engineered oak flooring, including our unfinished options are suitable for under floor heating, providing enough strength and stability to handle the heat with no problems at all. If you are considering underfloor heating for your home, you might want to take a look at our ThruFlow products that have been designed specifically for this installation situation with efficiency in mind time from the savings in your heating costs. Also available for use with underfloor heating are the Unfinished Mixed Grade Engineered oak flooring, Unfinished AB select grade oak engineered oak flooring, our Square Edge Unfinished AB Select Grade and also our Unfinished Extra Wide Engineered Oak flooring. Whichever option of unfinished flooring you choose for your home, you can select to have the flooring made to look more “distressed” in the finish or to finish it with your choice of wax or lacquer to create the perfect look for your home – we have even seen a bright red lacquered floor from an avid Liverpool Football Club supporter!